Saul is reliable, well organized and helpful. Traditional values are important to him, and family also plays a central role in his life. He is always ready to listen to the worries and problems of others, and will spare no effort when asked for help. With empathy and understanding, he can sense what other people need. He is always willing to highly regard the strong points of the other person and to excuse that person’s weaknesses. He shows his feelings openly and honestly. He prefers clear, structured surroundings and work processes and finds too much change and unrest unpleasant. His strong points are carefulness and reliability and not so much flexibility and spontaneity. He is open-minded towards anything new only to a limited extent. But, should one be looking for someone to fulfill a task reliably and exactly, Saul is the right person to ask. ​Saul was an only child and was raised by his father. His mother, who was not a Wovlen, died giving birth to him. 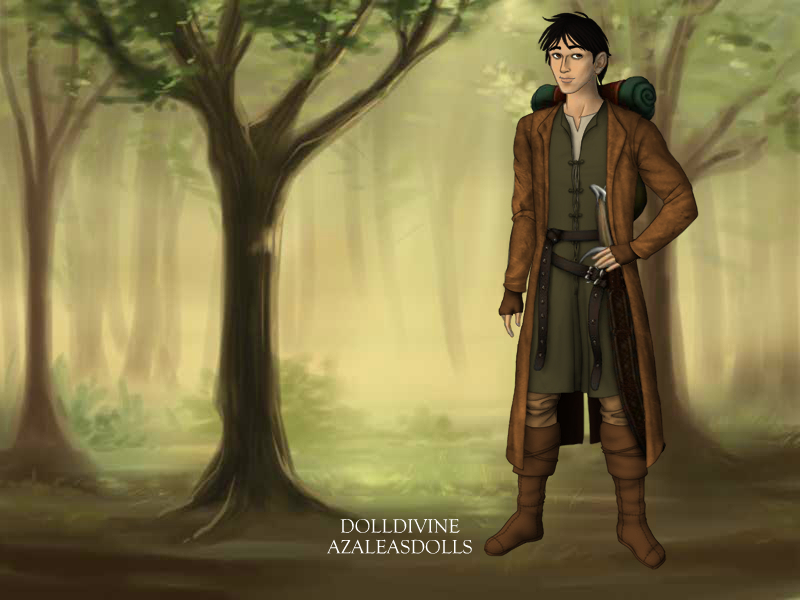 Saul grew up in the large Wovlen tribe led by Keegan's uncle, and was never without a lack of playmates. He matured quickly in body and mind and had a fair, caring nature, so he was a favorite among the other children. His father was the first man to die in the massacre of the Wovlen village, but he was able to warn the leaders of the coming army, and this allowed some of the people to escape the village alive, including his own son. During the attack on the village, Saul found Alia, Keegan's sister, and led her out of the village. There he found Brainna and her baby brother. He led the girls to safety and found a cave for them to take shelter in. He tried his best to take care of all of them, but within a couple of months, Brainna's baby brother died, and all three of them grew very sick. A wandering prospector and his son, Baylin, happened on the cave and found the group. The prospector took care of them and helped them all to get better, then he led them to the edge of the wilds, closer to civilization. He and Baylin helped Saul build a house, then he left them to go prospecting in the mountains. He never returned. Saul and Baylin took care of the girls for the next eleven years, during which time Baylin married Alia. Two years later, Baylin was gored by a wild boar while he and Saul were hunting and bled to death. Saul tried to save him and did not return home to the girls until the next day, dreading to give them the news. Alia was expecting at the time and had her baby a few days after Baylin was buried. Three months afterward, the baby grew very ill.
Saul ran for three days straight to the nearest village where he found a healer. He used all the money that Baylin's father had left them to rent horses and pay the healer in advance, but when he arrived back at the house two days later with the healer, the baby was already gone. The healer gave half the money back to them, and returned to the village where she spread stories about Saul's impressive determination to save the child. This interested a merchant passing through who needed help to move a herd of oxen down south to the Gilidar seaports. He contacted Saul and offered to pay him a good sum of money if he would agree to help. Saul accepted only at the prompting of Alia and Brainna. Nearly two months later, Saul was making his way home and, outside the village Temroth, he heard someone cry Keegan's name. Hoping that it was really Alia's brother, he rushed in to find Keegan and Susun washing down the river. He pulled them from the river and recognized Keegan instantly by his ring. His surprise at finding Keegan was momentarily displaced when he looked at Susun for the first time, though. She was in shock and delirious, but Saul fell in love with her right there and was overcome with fear for her life. He held her close as Keegan led him to her home. He talked to her and whispered in her ear, begging her to stay awake, willing her to stay alive, and telling her that he loved her. Later on, when Susun was better, she told him that she could remember him speaking to her. She expressed how his words at the time had kept her from slipping away, and that they continued to touch her deeply. The two of them kept this between themselves and formed a close bond during his short stay with her family. ​Before he left to take Keegan back home to Alia and Brainna, Saul asked Susun's father if he might visit the family again, specifically to see Susun. Susun's father gave his consent, so Saul left Susun with the promise that he would return again.